(Nanowerk Spotlight) The food chemistry Maillard reaction is responsible for many colors and flavors in foods – roasting of coffee, baking of bread and sizzling of meat. Scientists from National University of Singapore, Ghim Wei Ho and her team, have made use of this ingenious food chemistry to 'cook' their copper nanowires. Naturally, a lingering chocolate-like aroma was detected during the copper nanowires synthesis. 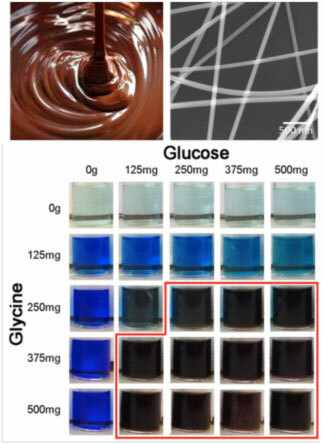 The findings have been reported in the November 7, 2014 online edition of Green Chemistry ("Facile control of copper nanowire dimensions via the Maillard reaction: using food chemistry for fabricating large-scale transparent flexible conductors"). 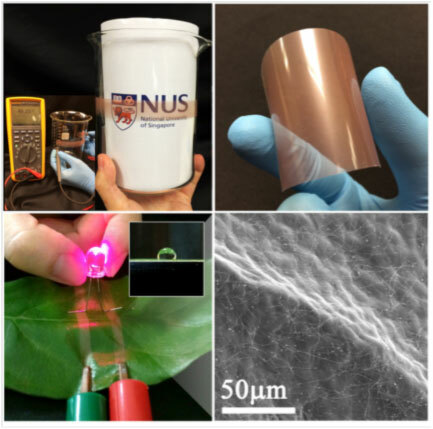 Metallic nanowires, especially cheap and abundant copper nanowires, have huge potential applications in miniaturized interconnects, sensors and transparent conductors featuring solar cells, touch screens and LED displays. Traditionally, indium tin oxide (ITO) is the most widely used transparent conductor in today’s consumer electronics. However, alternatives are being sought due to the high cost and finite supply of indium. Films made from copper nanowires are promising candidates, exhibiting high conductivity and optical transparency in addition to being flexible. Copper nanowires are typically synthesized by the reduction of Cu2+ in solution to its metal form using hydrazine and ethylenediamine – both of which are notoriously hazardous and toxic. Kevin Moe, the main researcher in this study and the paper's first author, has uncovered a green approach that formulates copper atoms in water to form untangled metallic state nanowires. The thin and length-optimized nanowires can then be transformed into smooth transparent, conductive films that can be easily and quickly transferred virtually onto any substrates – glass, plastic or even superhydrophobic lotus leaves. The Maillard reaction between amino acids and reducing sugar occurs at approximately 140-165°C. By varying the type and concentration of reducing sugar and amine in the presence of Cu2+, the team has been able to synthesize copper nanowires with a tuneable aspect ratio via a green route for the first time. Through the addition of glycine, the copper nanowires length could be systematically tuned from several millimeters down to hundreds of microns. Such capability should not be underestimated as it serves to prevent the nanowires from getting irreversibly entangled, allowing excellent nanowire dispersions without the need for surfactants. The concomitant increase in the nanowires' diameter to ∼150 nm allows improved sheet resistances without compromising optical transparency. The well-dispersed copper nanowires could be coated uniformly regardless of flat or curve geometries and wetting or non-wetting surfaces in every practical sense.